One is not enough. Two does not quite cut it. Three is closer. Since my neighbour has four, I will shoot for five. These are ramblings of a competitive environment where people boldly go, desiring to be first, avoiding being last. Competition is good. It raises economic activities and lowers consumer prices. It spurs something in all of us. Do more; Earn more; Spend more; Get more, seem to be the four traits of the modern life. The economy thrives when businesses grow. This unwittingly breeds a kind of busyness that can become self-absorbing and narcissistic. What are we to do with busyness, fear, insecurity and self-absorption? Perhaps one way is to first do a spiritual diagnostic. Let me suggest the following 4-stage model, which I call the stages of modern pride. Pride often begins innocently. We have been told that competition is good. It keeps people striving for excellence. As much as we encourage people to compete well, we receive not much guidance about 'how-much-is-enough?' Competition then leads to busyness. Unhealthy competition stems from fear. In a winners-take-all scenario, the fear is in getting outmaneuvered, outgunned or outdone. The disease is pervasive. Students out-copy their fellow classmates in taking class notes. Colleagues can use office politics to outwit one another to get good appraisals. Companies try to make their stocks outperform analysts’ expectations. Children out-smart each other, where some even justify cheating. Even parents try to make their babies out-‘cute’ other babies. Competition and busyness goes hand in hand. This second stage ups the ante. Fear of losing out leads to greater level of activities to outdo the competition. Competition can sometimes be a nice costume to disguise fear. The festive season is not exempt from this ‘competitive’ disease. As department stores compete with one another for the desired consumer buck, shoppers throng places offering the best deals in town. Drivers scramble for parking lots. Passengers rush for empty seats in buses and trains. Cabs drive recklessly to save time. Sometimes on Facebook, I would see some of the nice family portraits of my friends. I felt happy for them, for achieving a certain milestone in their lives. It makes me glad and give thanks to God for all the beauty and creativity that goes into each pose. Yet there is also a temptation to wonder about myself as well. Sometimes, it is hard to forget about self, and to simply enjoy the achievements of others. The thought: “What about me?” can be a glaring mark of the insecurity inside of me. Once I take the enticing bait of selfish thoughts, when I see a beautifully taken photo, I lament and start to wish for similar or better skills at photography myself. Like a pendulum, I swing from rejoicing with others, to the other end of lamenting about myself, complaining why others have all the goodies. Left to their own devices, fear and insecurity start to feed off each other. The ‘What-about-me” question leads one toward thoughts about I, Me, Myself. When everything revolves around the kingdom of ‘I,’ we have a perfect ego-centered person thinking that the world owes one a living. Self-existence and self-interests are primary. All others are secondary. A self-absorbed lifestyle can even lead to a fatalistic don't-know-don't-care attitude that grows more bitter each day. 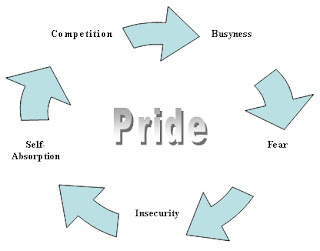 If left unchecked, we have the vicious cycle of pride. A self-absorbed person goes through the four stages again, even faster and more ruthless. The desert monks fled the world to escape from worldly worries, only to realize that the greatest battle is not outside but inside. Without the distractions of the world, they tackle most dangerous sin of all: pride of the heart. In other words, pride is not to be taken lightly by anyone. Let me give my 4 brief suggestions to tackle the four stages of pride. I call this the four correctives. Instead of trying to outdo one another in the name of competition or excellence, why not cooperate and help one another recognize that this world is big enough for everybody? Instead of a non-stop rush to do things, why not pace ourselves by healthily engaging them? If our friend walks, why not walk with him. If our colleage runs, why not jog with her? If a person’s maximum speed is only 50 mph, travel with him at 50mph. If he is faster or slower, adjust accordingly. If our efforts to do things stem from fear, take a pause. Pray and seek God for faith to trust him. If we are increasingly feeling self-centered, get out of our comfort zone and start giving our time and resources to help others be successful. One of my favourite stories is the Christmas story surrounding the orange. Many years ago, there was an orphanage in one of the Scandinavian towns managed by a strict headmaster. Each Christmas, each child gets a whole orange as a personal gift. The children in the orphanage are expected to observe the rules of the house, failing which, they will not get the cherished fruit gift. Annually, the kids all look forward to savouring their only gift of the year. As the day approaches, they will be diligent with their chores, adhere to their bedtimes and obey the rules of the orphanage. They will not want to offend the master of the house, a strict disciplinarian. One year, there is a new orphan in the community. Upon hearing the news that the annual gift will be placed at the Christmas tree near the entrance of the house, she let her excitement get the better of her. Unfortunately, she is caught peeking at the tree in the middle of the night. The punishment is severe. She will not get an orange that year. The next day during breakfast, as each child receives an orange, she stays in her room. As she sobs, as she wishes that her headmaster would not be so stern, she hears a knock on her door. She opens the door and is surprised to receive a napkin wrapped around some object. Thinking it is breakfast from downstairs, she unfolds the gift. To her astonishment, it is an orange, cut and put together in small slices. Each of her friends had their oranges cut, and one slice of orange donated from each friend, to make up one whole orange for her. Christmas is a great time to spend with family and friends. Many of us have been busy through the year, trying to cope with frantic demands of a modern culture. For some, they can unwittingly let competition spurring their busyness; busyness accelerating fear; with fear raising insecurity and insecurity compounding self-absorbed behaviour. Not all of them are present at any one time, but they are real challenges. Let us take an honest look at our lives and start noticing people rather than things. Self-reliance is deceptive. It tells us that we do not need anyone else. As Christians, we rely on God. As a church, we rely on one another. As a community, we rely on everyone to play their part. Otherwise, too much focus on the self reminds me of a medical condition; that when a cell draws all resources and attention to itself, it is called cancer.